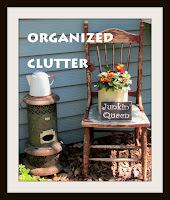 I love to try new ideas that I see on Pinterest and on blogs. When I saw Becky's rusty ornaments from the Beyond the Picket Fence blog, I knew I had to try her faux rust technique. These rusty, white metal-looking ornaments actually started out as felt ornaments. Click on the link or photo above to see Becky's felt ornament transformation. The papier mache deer also got her rust treatment. My sign project begins with these wooden letters purchased at the thrift shop for $1 each. Following Becky's rust technique, I started with black, orange and dark gray acrylic paint. And even before the black dried, I stippled on gray. I stippled on the orange last. Then I sprinkled the letters with cinnamon, and worked it in just a bit. White paint was stippled on last after the dark paint and cinnamon dried. (I see I didn't take a photo of the white paint step, but this is personal preference how much of the dark rusty undercoat shows through.) Lastly, I sprayed a matte sealer on the letters to protect the paint finish. These are some old boards I was saving for a project. The boards were about 4 feet tall and irregular on one end, so they were not sawed off, but attached together with two small wood braces. A rustic metal snowflake was nailed in the center of the "O". The letters were attached with screws. 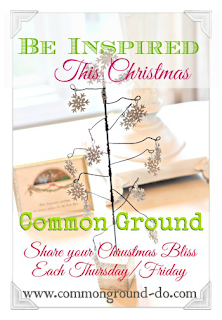 This sign will be part of my outdoor covered patio Christmas decor that I will be revealing sometime next week! Love this! The addition of the little metal snowflake was an inspired touch. Love them and I love this technique! I want to rust everything! Great idea, Carlene! Looks great!! Love it. It'll be perfect on your patio. N O E L is our special phrase for Christmas!!! "Mr. Ed" made me a set of N O E L blocks last year for Christmas. . . I'm copying several of your photos for him as a pattern!!! I, too, have a partially covered front porch. . .you have inspired me, dear one!!! Your painted letters look fabulous on the weathered wood boards! I love the sign! The sign look great...love it!! I just might have to try this. My local craft store has the wood letters and they are having a sale this weekend. Love this sign and what an interesting technique! Now I know what to do with some of the partial pallet boards I have! Carlene, you continue your amazement. This turned out great!!! Great Idea! LOVE LOVE the letters! So vintagy and Festive! Your sign looks great and that was a great deal finding the letters at the thrift store too. It is going to look great on your covered porch. I shared a hand painted PEACE sign this week. Love your sign and you sure scored finding those letters for a buck each! Very festive..great job! Nose is orange paint on lid handle. I swapped out the grey and orange for brown, kept my strokes horizontal and ended up with a birch tree effect. Thanks for the inspiration!